I have fine straight hair and my mom has curly thick hair and we both love it! Makes your hair soft and manageable while keeping the frizz at bay. I'm a long time fan of the brand, and this is my favourite treatment product. I have very fine hair, prone to breakage and fly-aways. I use this daily after a shower and it certainly helps. It doesn't weigh hair down at all; it doesn't feel like there's product in my hair. This is SUCH a beautiful product. I have fine hair that was brittle on the ends and I tried a number of the trendy oils without much success. I saw this on a youtube channel and decided to try it and I'm so glad I did. The texture is lovely and it spreads evenly in my hair. My hair is moisturized and smooth without any added weight. The price is intimidating but for me it was worth it and I'm sure it will last 6 months at least. Highly recommend! This is a leave in hair product that eliminates frizz and adds shine but doesn't weigh hair down. My fine, thin, dry hair could NOT live without this product. It has the consistency of a face moisturizer; you need very little so a tube will last several months, almost a year depending upon how long your hair is. It's lightly scented so not annoying. 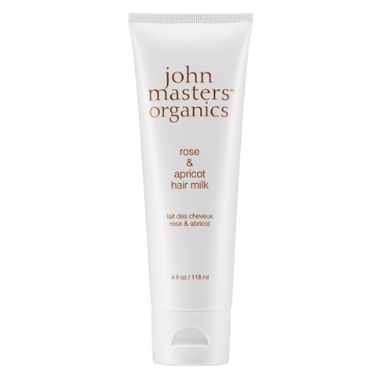 I love John Masters products because of their ingredients and how well they work. The rose and apricot hair milk is no exception. Makes hair healthy and gives it shine. Also has a very nice, sophisticated smell--the apricot brings a freshness to the genuine (not synthetic!) wild rose scent. It is not overpowering at all and you only need a small amount to see results. Highly recommend. Thanks for carrying it well.ca! Simply amazing. Transforms hair to silk and a little goes a long way. I have hair down to my bum.